You know how elementary school students always celebrate 100 days of school? I figured we should do a little celebrating, too, because yesterday marked 100 DAYS OF THE DAILY PAINTINGS! This sweet little guy is number 100. The plan is to keep going for the full year, so I have much more to go, but I’m pretty excited about making it to the 100 day mark. Here’s the whole collection from day 1 through 100. I have been posting these daily on instagram with captions. Most of the time there is a story behind the painting and so these act as a bit of a daily journal. It is such a fun little project. To celebrate 100 days, I’d love to give away a petite print to one of you! Simply leave a comment with your favorite from the first 100 days and I’ll choose a random winner next week. For an extra chance to win, pop over to Instagram and enter over there as well! I’ll choose one winner from the blog and one from Instagram. Good luck and thank you SO MUCH for all your kind words and encouragement these past few months as I have been practicing and sharing my art. You’re the best! Really love the London Park House! They are all adorable! The eggs, Ballard Canyon, and the gift tag are my favorite! The Kitchen Aid! I was just thinking I would like a new picture in my kitchen and this would be lovely. Blue bird please…. or branches in striped back and white vase, or flying blue bird… so many beautiful prints You really need to start selling your art. You are extremely talented!. So many pretty ones!! What a fun challenge. I like the bluebird and the bouquet of flowers. They remind that Spring is coming! I really love them all! My favorites would be the pretzel, landscape, petite bouquet or the toothbrush and toothpaste – it would be so cute framed and displayed in a bathroom! It’s really hard to narrow it down to just one favorite! I think i will just give you my top 3: bunny, roller skate and airstream. Thanks for sharing! Hi Emily! I agree with all the others that it’s so hard to choose which one is my favorite! But I do love the bluebird, I’m a birdgirl! Thanks for sharing your talent and helping others develop theirs! Love the “With love” gift tag or the gold cube studs! I love the bluebird. So sweet. I love the roller skate, the color called to me and it brought me back to my childhood. The Airstream, the roller skate, the whale, the lighthouse – how can I choose only one?! These are fabulous and I love them all. Thank you for sharing this with us!! The deer is my favorite! All of the prints are lovely! If I had to choose ONE I would say the whale. Great work! Hmmm…It would be a toss up between the blue bird (can never resist a bird) and the yellow flowers. They are all beautiful! Congratulations! What an inspiration you are. I love all of them. I’m partial to your snowy house but think the little bunny is my favorite! Thanks for sharing these beautiful little paintings that brighten my day. I’m looking to what you will paint the rest of the year. I love all your cute watercolour mini’s. They really made me want to pick up mine and give this a try. But from all these 100 paintings I just LOVE the Bunny, but also like the Dark Green book, the Green Pink book, the Blue Bag, and the Handcream. …Hmm I could start with my own handcream that is right in front of me, ^_^. Thank you so much for the inspiration and the change on winning one of your mini paintings. What a beautiful thing to keep this commitment you made! Such an inspiration. I love them all, but my favorite is the ranunculus bouquet! So lovely! Can’t wait to see what you paint next! Thanks for sharing these with us. I love all of your minis. I would frame so many of them, but your polka dot paper wrapped bouquet, the toothpaste and toothbrush, and the beautiful whale and some of my favorites! You’re definitely inspiring me to want to paint. Now I just need to set the time aside to actually do it! I like the watercolor look to pictures, so of course I like them all. If I had to choose it would be the animal and bird ones. I would probably say the bluebird, the fawn, or the bunny. I think you should make a big set of notecards with many of these designs on them!! Tough to choose because I love all the everyday items. The one of your journal is my favorite so far though! That bunny is pretty darn cute. Going to have to try my hand at that one soon! I like them all but I am drawn to the bunny too. Really they are all just delightful! Such a hard choice! I love them all…I guess the dressy heels, the scissors, or the birthday cake. They are all so special. They are all so adorable , I love seeing the new one for the day! I pick the bluebird, such a sweet little guy , I also adore the birthday cake . We celebrate birthdays for all ages in my house, it’s a wonderful reason to be happy and wish blessing for another year. 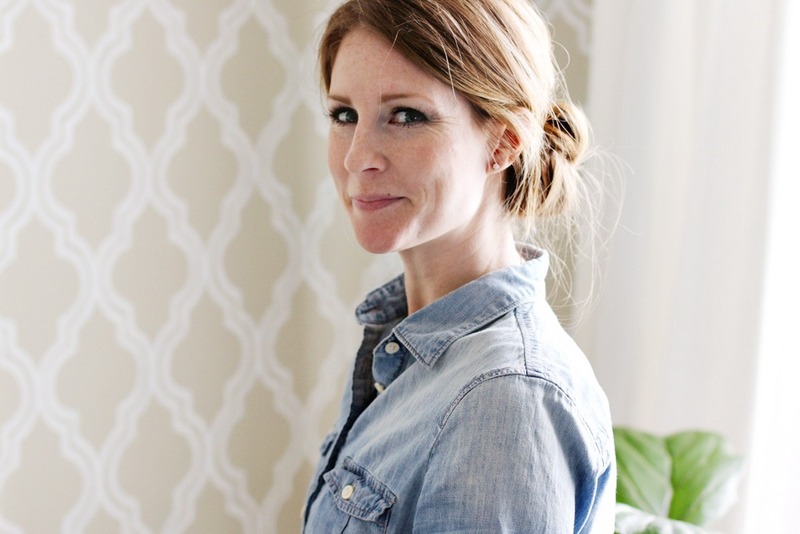 Emily – I have pared down my blogs…just too many, but you remain and at the top of the list. Love your posts…looking forward to your book, and love that your recommendations are Christian themed (heart!) Your paintings have inspired me, as I am just getting ready to start practicing watercolors (have pared down my busy life also) :-) My favorite of yours is the single topiary print….I am in love with topiaries! But they are all beautiful! Many blessings to you and your family! I love so many of them! I am all about botanical lately! The fiddle leaf is a top contender! I can’t choose between Bodie Island lighthouse & Lucky Charms! I also adored the Starbucks watercolor’s “First Date” story as well as the video of creation. I love watercolor art and love all these equally but the Happy Birthday hat is very sweet. Gosh! So hard to pick! I have loved the bouquet you received from your editor (agent) 🤷🏻‍♀️ when you signed for your book contract the most! I like so many, but the bunny is my favorite! She looks llike the one my children used to have named Butterscotch. Butterscotch surprised us on the morning we we’re leaving no for vacation by having 5 babies! I have a lot of favorites! Buuuut, my very very favorites are the fiddle leaf fig and the petite boquet (the one wrapped). My favorite is the bunny – so sweet and perfect for the season. Atlas is my favorite! He and my dog, Henry are twins!! Your gold handled scissors look so much like a photo. But I really love #100. That’s a cute little bunny. Keep it up! You are such a brilliant artist!! I love the petite bouquet and the honey jar! I love all of the animals and flowers. I would like to paint the too if you added as pencil outlines. The ginger jar is <3. I would have to say the Maldon Sea Salt box that I would hang in my kitchen! But the bunny is so cute and I love the little bluebird as well!! So hard to choose from this beautiful collection! I really love them all! I love the watercolor paints with the paintbrush, you are so inspiring! The bluebird is so cute! We have them here in Ohio. However, the bunny is also adorable! I like them both! Love the eucalyptus in the vase! The bluebird has been a favorite of mine until this little bunny showed up. The bunny is my favorite. super cute paintings! too hard to choose just one favorite. These are all so beautiful, but I think my favorite is the whale! What inspirational sketches! I love checking out what you have done. The bunny is one of my favorites! They are all adorable! So hard to pick a favorite. I love all the flower ones but I think the little bluebird is my favorite. Yes, very hard to pick a favorite. The are all adorable. But I’d be happy to have the little house join my collection of house prints. Or maybe that fat little bird. All of your drawings are adorable it’s hard to pick a favorite! I love the little spotted fawn! The balloons & your snowy house are close seconds! Thank you for sharing your beautiful talent with us!! I love the cheery pie as well as the bunny. Very inspiring!! Note cards of all would be wonderful! My favorite is the bluebird – it was my dear grandmother’s favorite bird. When I was a little girl, she had a tiny little porcelain bluebird on one of her kitchen shelves. It now sits in my bathroom cabinet so I think of her often. Whenever I see one out in my yard or anywhere outside, it feels like a warm hug from God assuring me I will see her again one day. artwork with us. These drawings are truly a blessing from the make of all, Christ! May God bless you on your future endeavors! It is fun to see what you choose each day! Thank you for the opportunity for your readers to share about a favorite! We live in a wooded area and we love spotting the fawns…such precious memories with my girls! We also taught them the song that inspired your sweet deer when they were little so all that to say my personal favorite is your darling fawn! They’re all so amazing! It would be hard to pick just one. I’m loving the tassel earrings and those blueberry pancakes. Such awesome work! I love them all!! I think I’ll choose “gift tag” as a favorite. I love the simplicity of it. It reminds me that we are called to Love… Love God and Love our neighbor with the very essense of God, who is Love, embodied in Christ. Love can be our gift to everyone we encounter. I see that in you. Thank you for your inspiration. Hard to decide, but I really love the sweet bunny! Oh my goodness! How do you choose! I love them all especially, the flower ones. I guess it is the cherry blossom, hard to choose! It is a blessing to see you using the gift the Lord has given you and to bring HIM praise and glory! I love the little bluebird- he’s so sweet! You are so talented and inspiring. Thank you for the giveaway! They are all so cute, but especially love any of the florals or the kitchenaid mixer. The lighthouse is one of my favorite because it is a happy place for our family vacations. And then I love the bluebird because I have a family of bluebirds who appear in my backyard every summer. But I love all your works of art – so talented! They are all so amazing! I love many of them but I’d have to say one of my favorites that I’d love to hang up somewhere would be the whale. Also just wanted to say I feel like we can see your improvement as you’ve gone along! The kitchen aid mixer is absolutely amazing and so is the detail in the roller skate (and other ones too!). It’s so fun to be able to see these so thank you for sharing! Hi they are all super cute! I’d love a little book of them all – or a pack of notecards! I adore the landscape and the cute bunny! But, quirkily, I’m going to choose the little with love tag. I’m so inspired by your project! I have been dong project 89 and loving it and now I am nearly finished, maybe I will go back and read the chapters again and make a little picture for each one! So hard to pick one!! They all are precious ❤️! I am always drawn to flowers- so the bouquet of flowers 💐. Exciting to see what God is doing with your gifts. I love both birds (flying and standing) but the bunny and deer are close seconds! The bunny, for sure ❤️ LOVED looking at all your beautify creations! The bluebird and the bunny are my favorites. The have such sweet personality. think the Fawn is my most favorite.But I love so many of them, The bunny is Adorable!, The fat Robin… I even like the ball cap. Very nice job and congrats on making your 100 days. winter citrus would be my pick simply because that is your painting that prompted my courage to try your water color challenge. I was very inspired after watched your short video on repeat. you are a gifted artist, writer and teacher! thanks so much for sharing your journey and encouragement. I really like the eggs! The bunny is just so sweet! I really like that fat bluebird too. Goodness, these are stunning! My favorite is petite bouquet but goodness that was a tough choice. Thank you for sharing these with us, what a gift! All of your work is beautiful. The hilly landscape caught my eye as it reminds me of my son and daughter in laws vineyard in Paso Robles California. We live on the opposite side of the US in Georgia so our visits are limited. But seeing this made me smile and think how blessed he is to have such a beautiful “office”. I love, love the notebook. So bright & colorful. Also the airstream cuz we have one too & the rain boots. I wish I could paint like that! 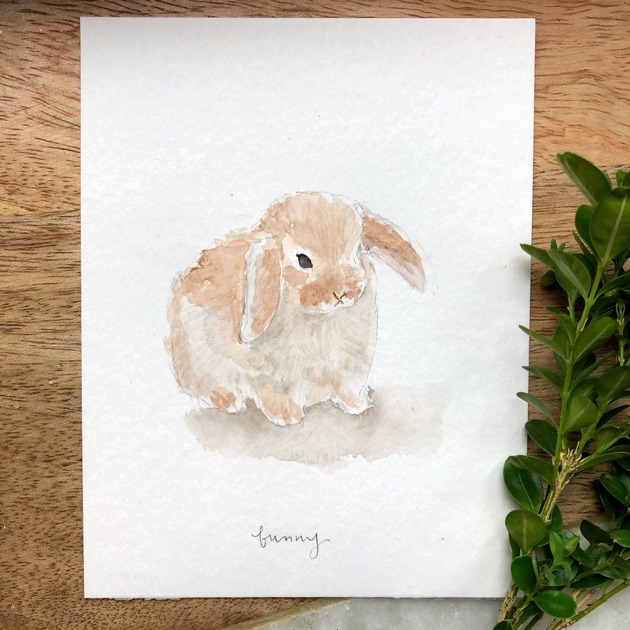 The softness of the watercolors made the bunny come to life…..it was as if he could jump right out of the paper and into my lap. Magical. They are all wonderful, but the whale speaks to me about the wonders from under the sea. “the mountain is out” has such a connection for me living in Washington State, majestic and regal. You are such an inspiration, thank you for sharing your passions. I gave a set of watercolor paints, brushes and paper to a friend who just had surgery. Long story short, your lighthouse inspired her too, as her close relative was an avid collector of lighthouses! Now I’m painting and anxiously await to see what you paint next. Maybe you should sell your prints? So hard to pick just one! But I think my favorite is that fat little bluebird. They are all incredible! The little deer is especially sweet. Love seeing what you come up with each day with your watercolors! My favorite so far is the whale. My family went on vacation each summer to Cape Cod. One year when I was in grade school my Dad bought me a blue mug with whales on it as a surprise and that was the start of a collection of all types of whales items and my love of the animal. I am in my fifties now and have gotten rid of most of my whales years ago but I still have my whale mug! I love the landscape with the rolling hills & the little blue bird. So pretty! Hard to choose! If I won, I’d choose the roller skate for my mom but for myself I’d probably pick the avocado or yellow flowers. Not sure if I submitted correctly, so this might be a re-send. Your home, where your journey begins. Your home…where your journey begins. You’ve inspired me to start painting! I’ve bought all my needed items and hope to begin this summer! I think all of your paintings are beautiful but I really love that little bunny! So adorable!! oh, you make me smile! the kitchen-aid mixer is so me! baking, baking, baking so much I wore out my old mixer and bought myself a shiny red “sporty” model kitchen-aid! what a beautiful collection of watercolors picture. I think because they are smaller they become quite endearing in their own sweet little way. what a great way to journal your year! keep going…I love them all. I’d say the kitchen aid mixer, I’d love that in my kitchen! I love them all, especially the yellow tulips! I love 100! Bunnies make me smile. These were so fun to see as a group. Love the bunny, the robin, and the swallow. Are you ever going to make these drawings available to us? Not at this time. I will hopefully offer them at some point and would love to create a little book once the whole series is completed. They are all super sweet pictures but I think my fav is the “happy birthday” party hat. It is hard to pick just 1! I like the yellow sprig of wildflowers, your lighthouse, the bouquet, and the round bluebird. I love seeing the variety you have. You are very talented! It’s so difficult to choose a favorite, they’re all so lovely! I think I’m drawn more to the plants and florals, particularly the topiary. So pretty! My favorites aware the little deer and the bluebird. They all are wonderful! The bunny is so adorable. I also love your notebook. Looking forward to seeing the rest of the year. Let me join everyone in saying I like them all, really. If I win, will you choose one for me among the whale, the pie, and the party hat? You’re so incredibly talented! I love the balloons! SO fun to pull out to celebrate every birthday! For me it’s a toss up between the d’orsay heels and that cute little bunny. EVERY one of your paintings is lovely. I love your style and the whimsy in your art. So many of your pieces speak to me…the earrings, your favorite lip gloss, the SHOES! But so far my favorite is your sweet painting of Atlas..so beautiful! I love them all! But I think I like the bunny best by a little margin. He’s darling. I can just see his softness! These are all precious. I love the blue roller skate—it takes me back to my days at the roller rink! I love the lighthouse. And the deer. I am so inspired with your dedication to this project! Your works of art are beautiful! I love all of your prints but I am so drawn to one of the wrapped bouquets. Must I choose? Then the wrapped bouquet. I would like to hang that on my gallery wall, right next to the Jane Austen quote. I absolutely love all of your sweet small paintings…. Hope todo this soon… Guessmy Favorite would be the bunny! My favorite is the camouflage shirt that says Be Kind. You are an inspiration! I’m seeing you grow as an artist through this whole process! Kudos! Wow, how do I ever choose?! You are so talented…I’ll go with the sweet little bluebird! I’d be happy to own the snowflake or any of the floral bouquets. Thanks for the giveaway! These are all so wonderful that it was hard to decide. My favorite is bluebird because bluebirds are such a wonderful sign that Spring is here. I love eggs print and the verse you posted with it. Hard choice! The bouquet on 3-5-19 is one of my my favorite. Oh, how to choose just one? I love Audry’s sweet little shoes. I’m inspired by your watercolors over the years. I absolutely love all of them and look forward to seeing each new painting. If I had to pick one it would be the paints and brush. What a great project! I love them all, but favorites are the lighthouse, California and the olive tree. Can’t wait to see the rest! I love the bunny. Probably because I have 2 pet rabbits named Winston and FooFooCujo. But I do love the drawing. It captures the precious rabbit perfectly. They are all fabulous! You are so talented. Love them all. I’m especially drawn to the birthday fox. So many that catch my eye, but my favorite is Winter Citrus! Congratulations! I love them all and can’t wait to see how you keep going throughout the year. I have to say that Atlas is probably my favorite because I have a black lab, too. They’re all beautiful. I love that you have taken up this project. So many times when you are busy with a family you don’t take time for a hobby. You’ll always cherish these, but not as much as you will cherish your vacation in the airstream. And for that reason the airstream is my favorite. I love the little shoes with the flowers on top. Just so precious and painting simplicity made them all the more endearing. Choosing just one is difficult, but your beloved notebook is very representative of a hard journey I’m on with the Lord right now. Plus it’s a notebook I’d totally pick out for myself. Thank you for wanting to share! Xoxo. My favourite is the raincoat! VERY hard to decide. Love the petite size and subjects. Think I’d choose the lighthouse since we just finished a home on the oregon coast. I have a large stretched canvas of your white pumpkin. I’d buy your little watercolors too if I could. I admire your diligence to paint daily for 100 days! Way to go! I love your paintings of pancakes and balloons. They are all so beautiful! The fawn captured my heart as well as the bunny! You are so talented! So many choices of everyday things! I like the paints and brush best. I love the egg carton and tea towel. Keep it going. Daily sketch | 3-19-19 | eucalyptus . You have captured the colour perfectly. Thank you for sharing your God-given gift. Your bunny takes the cake Emily – reminds me of my own dear little Audrey who just turned 3. Happy Spring! My favorite is the toss up between the keys and the bouquet. I like the time clock! It reminds me to make the most of every minute, because we never know when our last minute will be, whether young or old. The ‘paint and brush’ is my favorite followed by many seconds! Your 100 day project has inspired me to take your water color class and spend a little “me” time fostering my desire to learn more and work more with water colors! Thanks for being an inspiration! The KitchenAid mixer stands out to me. The color and shape…it all just pops and seems like a fun print. Love your art and inspiration. What a fun, sweet idea Emily! There are so many I like, but I think the turquoise stand mixer is my favorite! I look forward to seeing the sketches and showing them to my daughter; I purchased the Simplify Watercolor class for her and she has so much fun with it! Who could resist the fluffy bunny- my favorite! Definitely the Bunny!! I’m a sucker for all things Bunny related!! So fluffy and sweet! So many lovelies. Love the landscape. I can’t decide between the blue bird in flight or the yellow tulips. Love them all but the landscape from when you were down in (I think) California with the grapevines is my favorite! All your paintings are beautiful, but I love the bunny……..
Hi Emily–Thank you so much for the inspiration! I have none of your fabulous painting talent but have been following along with your daily prompts by writing a paragraph or so about each of your topics. It’s gotten me started writing after a long dry spell and I can’t thank you enough. My favorite painting is the beautiful book (1st row, far right) that reminds me of the creativity that can blossom in each of us. Can’t wait to continue this journey with you! Such a fun daily relaxing project. I would so love to have bunny. Thank you for the oppoetunity Emily. They are all lovely! The Kitchen Aid mixer is my favorite though, such a beautiful shade of blue!! so many!! I like the fiddle leaf fern in the basket if I have to choose, but I like all the botanicals/outdoors ones. So wonderful – thanks for sharing! They are all beautiful however, the bouquet of flowers is my favorite! The bunny is my favorite, so soft and and whimsical! I do love them all, beautiful collection! Love the pie…just love pie. LOVE them all!! Its so hard to choose…I will go with bunny! Thank you for sharing your gift with us- these are all so truly beautiful!! The cherry blossom print is beautiful! Absolutely in love with the fiddle leaf! You are so talented! The Lucky Charms box is my favorite, but I love them all! The fat li’l bluebird makes me think of my mom, who loved birds. Your watercolors are lovely! Blueberry Pancakes because everyday starts off best if it stays with pancakes! Hooray! What an honor. I love the deer, the paints, the snowflake and all the flowers. That bunny is precious. I’m excited to see more! i love the eucalyptus and the floral notebook! I love the deer, the bunny, the round bluebird and the “with love” tag. Congrats on 100 days! I love the little stack of pancakes most! They’re all good, and I especially love #100. Bunnies are my favorite animal. The Gaston book one also caught my eye because I’ve read it, and it’s adorable! It’s hard to choose but I love the bunny! It’s so hard to choose because they are all so amazing. I love the blue and white ginger jar. I’ve tried painting one and it wasn’t easy for me. I also, love the bouquet of flowers. I absolutely love your watercolor paintings! Thanks for letting a lucky winner own one of them! Thanks again! You are an inspiration for sure!! Thank you for sharing, you make the world a better place. I love them all, but the little deer is maybe my favorite. The bunny and the bluebird are my faves! I just love the baby deer and the bunny!! Love your art, you’re very talented! I love them all, but the wattle makes my heart feel happy and settled. It’s a little piece of home. The sweet fat blue bird would be my choice! I must tell you, I have been smitten with this project from the get go. I can’t wait to see what you paint next! I would be so honored and happy to have one of my own! Please don’t stop! Well!, that bunny is adorable but I’m leaning towards the mixer and the roller skate. What an accomplishment. I love the little bluebird. So cute! And well done on your 100 days! We all are richer for it! I love all of them! So thankful that you are doing this. Such an inspiration. My favorite is your landscape piece! I love all of them! One of my favorites is the deer! I think the cherry blossom is darling! They are all so so beautiful, but I really love the eucalyptus. They are all so lovely, it’s hard to pick just one. The bunny, the whale, and the mixer are among my favorites. My favorite is the watercolor paint set. I love the fluffy little bluebird! I love this and I am not an artist. My favorite the With Love tag. Hard to choose but since I love a good cup of Starbucks……the Starbucks cup is fun! Also the bouquet of flowers! I love the airstream and the round vase of flowers 😍 Way to go on your first 100 days!! I love them all too! The Kitchen-Aid stand mixer looks like the color of my kitchen walls (SW Sea Salt)! Congratulations on reaching 100 days towards your goal! I love seeing all your watercolors but my favorite are your animals, especially the bunny and the fawn. Looking forward to seeing more as you create each day! The little bluebird and the mountain is out are my faves! I love them all, especially the bluebird. Thanks for sharing! They all are lovely and make me smile each day to see what you have created. The whale, the mug, the paints and the Ricola are favs. Keep up the wonderful work! I always claim a can of glossy spray paint is the cheapest form of therapy but you’ve topped it! Scrolling through your work is pure magic and sure to brighten any day. The Kitchen Aid mixer is genius! I love how you elevated the everyday. for 4 years and every time I saw Mt. Rainier I was in awe! It never got old! Blessings to you Emily! Thank you for sharing your gifts with us! The bunny and the bluebird are definitely my favorites! Such sweet paintings Miss Emily! In order of favorites, bunny, canyon, fiddle leaf fig, deer, tulips. I’d keep going b/c they are all so pretty, but those are my top five favorites. Love love love these. All of them. if I had to pick, I guess I’d say any of the green potted plants or stems in vases. So hard to decide. The pink sprig (dogwood?). I Love the one of the front of your house because if looks so much like mine!! They are all amazing! I adore the bunny but also love any of the flowers and the blue and white jar. The petite bouquet would look lovely framed. The bunny is so sweet, but I also love the Petit bouquet. I also love the globe! You are so talented! The Starbucks cup makes me smile as it is a treat I get myself once a week. I love the Kitchenaid and the cherry blossoms, but there’s so many good ones! I really love them all! There’s something so sweet, pure, and lovely about each one. I would have to say I’m drawn towards the animals. The dog resembles our beloved pet. The fawn reminds me of the deer families that often cross the road in front of me as I run in my neighborhood. But with Easter around the corner I have to choose the bunny. It’s absolutely adorable and when I look at it, it makes me smile. Ps. Thanks for your book list yesterday. Church asked me to lead a summer book club and I’d been thinking through the ones I currently own and nothing was feeling right. But when I saw The Next Right Thing something immediately drew me to it. I loaded up the kids, headed to Books a Million and purchased it last night. I love it and have already told our women’s director it’s the book I would love to do! Hi, All are so beautiful. Specially love the bunny. I love the latticed cherry pie! It’s nearly impossible to pick just one favorite! If I must (ha!) then perhaps the olive tree or the deer! They all are so cute! I really like the Maldon sea salt and the Kitchen Aid Mixer. And the bunny! So much fun seeing your daily paintings. I love them all as a collection! But my favorites are the bouquets, the Ballard Canyon landscape, and the deer. :) Thanks for sharing! My favorite is the bluebird! I love the rosemary and the whale best I think, though they are all just adorable! I love the bluebird and the bunny! So special! I like your sweet little bluebird, but all your florals are lovely as well! So fun and beautiful! I love that you can find inspiration in everyday items. My favorite is the wrapped bouquet. Or the pancakes. Or the bluebird….too hard to choose. My favorite is the bunny because we have a wild bunny living under our garden shed. This doesn’t seem too unusual except we live in a very urban neighborhood. I Love all of your paintings, but ‘bunny’ speaks to my heart. All of your sketches are beautiful but I think the lighthouse is my favorite. I have to say the raincoat. I love that jacket and I always notice it in your photos. thanks for sharing all the “beauties”. I love the painting of the greenery(Rosemary-like)with the yellow bud! the roller skate – b/c of the memories it brings! The whale is my favorite! I like the ginger jar. I didn’t even know about these until you posted it. What a fun thing. I love the January palette and the fiddle leaf fig! The Bunny! He’s adorable! I love all the prints, but the bunny is my favorite! Ah, such a hard decision! I have many favourites but one of my top ones is the paint and brush. The colours are fun and it fits the stage of life I’m in with two little ones and another on the way :). I love the landscape one of the hills because it reminds me of my college days of living in San Luis Obispo. They are all so beautiful! I love the peachy red bouquet of flowers! Love the Peach Floral Bouquet all wrapped up… the blue bird is a close second. Such a hard choice. I love the bluebird, but the bunny is adorable too. Just love these! But if I have to choose, I pick the sprig of yellow with greens. Thank you for sharing them with us! Goodness – very difficult decision! I’d have go to with your mini landscape of California. But that bunny is a close second. I love the blueberry pancakes! Thanks for this fun offer and for sharing your lovely watercolors! the mixer would be my choice. I absolutely love your paintings! Since I’m married to a dentist and so is my son, the “brush your teeth” is my favorite. The blue bird of happiness is my favorite. So far! Can’t wait to see all your creations this year! Oh they’re all so pretty! I love the bunny or the kitchen aid mixer. Maybe the bunny is my final answer- it’s be cute for Easter! They are all great, but I like the alarm clock! -So hard to choose one…but the cup of coffee from Davenport is a sweet reminder of meeting you when I was visiting from Portland a few weeks ago. I love the Bodie Island lighthouse! I love so many but I think “bouquet” from 3/5 is my favorite. I love the fox and the balloon. I am having a hard time deciding as well. But my favorites are the cherry pie and the domino’s. They both remind me of my grandmothers. I think my favorites are the two bluebird paintings! I love birds. I’m having a hard time choosing but I like the fiddle leaf fig or olive tree the best. I love plants!! I love them all! I guess my favorite is the flowering brush, although I also love the pencil too.